When organizations choose to migrate to PrinterLogic in place of their old printer management solution, they expect to see myriad benefits. Efficient centralized management from a single pane of glass. End-users who experience enhanced productivity thanks to an intuitive and ubiquitous self-service portal. Massive increases in printing up-time across the enterprise. Amazingly easy mobile and BYOD printing that requires no workarounds or special software clients. The vast majority of PrinterLogic customers end up seeing far more benefits than that. Take the most recent example: an industrial manufacturing company spanning more than six different locations that had under 50 network printers and fewer than five print servers prior to installing PrinterLogic. The company achieved all those goals, resulting in an enterprise print environment that was more feature-rich and robust—yet also more transparent and easier to use for admins as well as end-users. "PrinterLogic simplified the management of printer installs, enabling our end-users to manage what printers they need, even when they go to a new location," said a senior IT architect at the company. Had the advantages stopped there, this industrial manufacturing company would likely still have been satisfied. But what sets PrinterLogic apart is the magnitude and reach of its advantages. It didn't just reduce the time that the company's IT department was spending on print management, it reduced it by an astounding 90%. To put that in some perspective, for every ten hours spent on print management before PrinterLogic, the company now needs only one. The number of calls to the service desk regarding print-related issues fell by the same incredible amount, and the remote server infrastructure shrank by 90% as well. That in turn drove down the costs associated with those areas. The company recouped its initial outlay on PrinterLogic in less than three months and ultimately saw a return on investment (ROI) of more than 400%! Better still, it took the company under a day to fully install PrinterLogic across the enterprise. 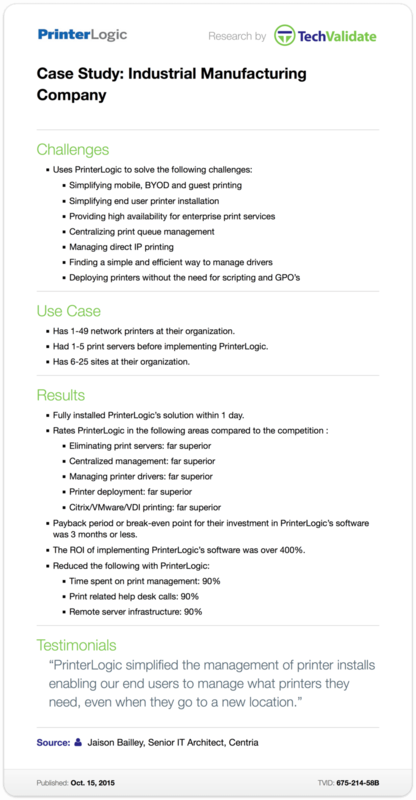 It’s case studies like this one that highlight not only the quantity of improvements that PrinterLogic brings to any print environment but also the quality of those improvements.